Sold by dreamfuture.Inc and Fulfilled by Amazon. Gift-wrap available. ▲ADJUSTABLE HEAT SETTINGS - Different from other dual temperature heat guns, ours provide variable temperature control. The black dial provides rheostat-type heating, the high, low switch on its handle provide air flow control. Temperature range from 120℉ to 1020℉, air flow: low setting 190L/min, high setting 350L/min. With cooling mode you can cool down the tool safely and conveniently after use. 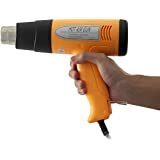 ▲WIDE APPLICATIONS - Ideal heat gun for shrinking heat shrink tube, shrinking wrap, heating PVC, electronics, cell phone repairs, vinyl wrap, removing paint or floor tiles, loosening rusted bolts, and other heating or thawing purpose. ▲4 NOZZLES - Fishtail nozzle directs a long, narrow heat pattern to the work surface. 2 Concentrator nozzles direct a concentrated heat flow to the work surface. Reflector nozzle disperses heat flow evenly around the whole work surface. ▲UL LISTED - Both cord and plug are UL listed, high quality material provide you with additional security. The 5.7ft high grade cord makes it flexibility and pretty enough to move around. ▲100% SATISFACTION GUARANTEE - Full refund & replacement guarantee with lifetime free warranty. Any question with our air hot gun, please feel free to contact us, we will do our best to satisfy you. Amtake - We commit ourselves to providing better products, better customer services. Widely applications for stripping old paint, removing old flooring, drying paints, removing labels and stickers, de-icing frozen water pipes, loosening rusted bolts, soldering, shrinking tubes, deforming of plastics and PVC parts, welding of plastics and PVC foils, removal of stubborn adhesives. 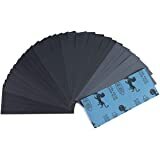 Directs a long, narrow heat pattern to the work surface - ideal for removing paint or varnish from large, flat surfaces such as skirting boards, doors and stairs. Good quality product at a good value for money price. 5.0 out of 5 starsAs a artist your heat gun is just what we need to work with resin! I am one of tge many that ordered it after seeing Artist Till Death Jeff and Erika use your heat gun. I love the adjustable heat for some projects need a cool setting while others need high heat. The attachments are wonderful to move the paint around. What i would like to know if you could make a silicone sleeve for the handle. We work with resin and use the heat gun in between and the gun gets sticky and sometimes the switch will stick closed even after you clean it with alcohol. So far, the gun is working well. I especially like the rotary rheostat that allows me to set the temperature I want. It's helpful that attachments are provided to fit various jobs. But. ironically, that's why I deducted one star: all the attachments fit except the one that spreads the heat out (see photo). That attachment came with the connecting end, which should be circular, flattened out. After trying to round it to fit, I finally resorted to using a worm-gear hose clamp to hold the attachment in place. I don't know if the flattened attachment is a one-off or not. At least I got it to work. 5.0 out of 5 starsCustomer service is top notch. Customer service is awesome!! 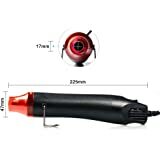 I am a resin artist and I had an issue where my heat gun dial was defective and it only got warm, not hot, after a few uses. Also, my fishtail attachment was slightly coming apart, which I use the most. I contacted Amtake and they’re shipping out a replacement immediately. And they got back to me within an hour of my email. I use this for resin work. 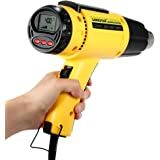 I had another popular brand heat gun and it burned the resin - the reason was only two heat settings. This has multiple settings from cold to hot and I can adjust it - which is wonderful. Does the job and does it well. Recommended. 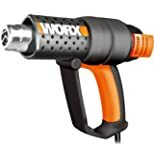 5.0 out of 5 starsBest heat gun for resin painting! 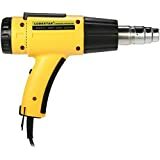 This is the best heat gun on the market! 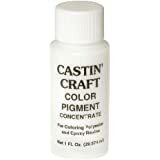 It is an absolute must buy item if you are a crafter. It is best for epoxy resin as it helps remove all the air bubbles, helps to move the resin without burning it. The attachments are amazing and durable. It has easy to use variable temperature control and is super light weight. 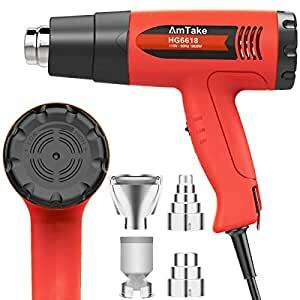 I highly recommend this heat gun. Also excellent customer service included! My email questions were answered within the hour!! Excellent product, great value and honest American company... Who could ask for more!! 10 stars!